The Assembly said terminations should be allowed without restriction up to the 12th week of pregnancy. 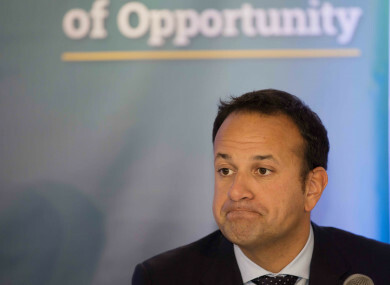 THE TAOISEACH HAS said he’s not sure if members of the public would support the Citizens’ Assembly’s recommendations on Ireland’s abortion legislation. Speaking at the Fine Gael think-in today, Leo Varadkar said: “I honestly don’t know if the public would go as far as what the Citizens’ Assembly have recommended. Public opinion polls have indicated that they wouldn’t, but that may change during the course of the debate. In April, members of the Assembly voted to replace or amend the Eighth Amendment of the Constitution – which gives equal status to the mother and the foetus. The Assembly recommended that abortions should be allowed without restriction up to the 12th week of pregnancy and for “socioeconomic reasons” up to the 22nd week of pregnancy. In cases of fatal foetal abnormality, it recommended terminations be permitted during any period of the pregnancy. Also speaking at the think-in, Tánaiste Frances Fitzgerald said abortion is “a very complex issues for individuals and for families”. “In terms of a response, I have always though the constitution is not the place to deal with this issue. In terms of the legislative response, we have to engage in that work. There’s a difference between recommendations from the Citizens’ Assembly and framing the response to put the choice to the people,” she stated. Foreign Affairs Minister Simon Coveney said he would be “surprised if, without a lot of reassurance and a lot of debate, the public would broadly be willing to support [the Assembly's] proposal”. “That is only a personal view. We have a long way to go and there is a real obligation as a government to ensure there is a respectful debate on what are very, very sensitive issues that divide opinions in a very sharp way. Sometimes these debates are dominated by hardline views on both sides and I think the government has a responsibility to go through a process that can allow a much more respectful and informed debate so that we can make informed choices and put a referendum to the people to allow them to make a really serious choice for the country. “I’m not sure there would be majority support for that at the moment but let’s wait and see how the discussion progresses,” Coveney said. A referendum on the Eighth Amendment is expected to take place before June 2018. The wording of the referendum will be decided in the coming months. The Oireachtas Committee on the Eighth Amendment met formally for the first time this week. It’s tasked with considering the recommendations of the Citizens’ Assembly before submitting a report to the Oireachtas in December. Email “Taoiseach not sure public would back Citizens' Assembly's stance on abortion”. Feedback on “Taoiseach not sure public would back Citizens' Assembly's stance on abortion”.